Flour Power is a fun, playful, and super-stylish baking show that is all about sharing the love and joy of baking. 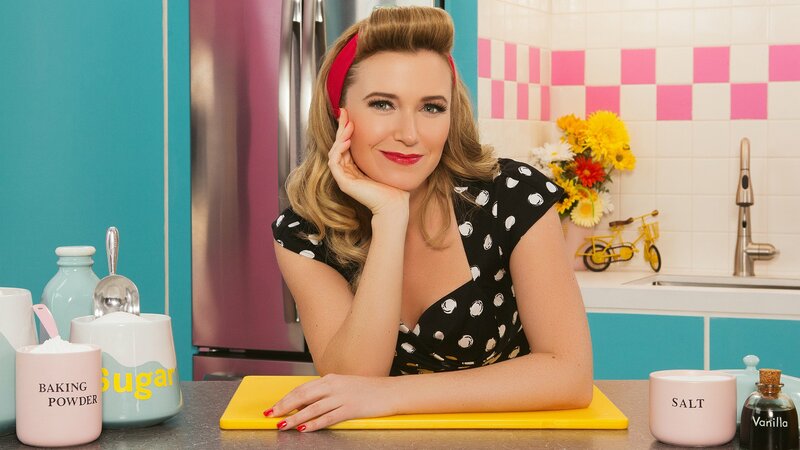 Set in a retro-inspired kitchen, our beautiful and brainy host Jessica McGovern shows us just how easy it is to bake a simple, delicious treat for your children’s bake sale or an extravagant masterpiece for an elegant dinner party; impressive recipes for every occasion. Host Jessica McGovern bakes up some delightful Italian classics. Host afternoon tea with Jessica McGovern’s nibble-worthy treats. Indulge in a little comfort food as host Jessica McGovern creates warm and cozy desserts at home. Host Jessica McGovern creates three yummy desserts that include fruits and veggies. Host Jessica McGovern shows how to bake magic-in-the-middle goodies. Baking is indulgent when making rich and delicious treats! Host Jessica McGovern shares some foolproof recipes for all things rich. Host Jessica McGovern offers tips and recipes to incorporate flowers in dessert! Baker Jessica McGovern offers tips on how to prepare adorable treats for any shower party. Host Jessica McGovern shows us how to make glorious desserts that you can eat with your fingers! Baking expert Jessica McGovern demonstrates the versatility of this wonder ingredient.